Longcot - Faringdon Community Website. Longcot is a village of 500 or so residents and lies to the south of the A420 between Faringdon and Watchfield. Kings Lane leads into the village, which is centred round the Green, with the church beyond and a good view of the Uffington White Horse on the downs in the distance. Find out more about Longcot village and the King and Queen pub. For most of its 1000 years it has been an agricultural community, a village of small family farms. 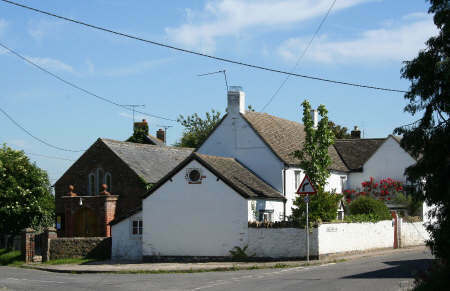 The extension of Wilts and Berks Canal into the village in the 18th Century brought prosperity and an increase in the population. At its height, the tonnage of coal, wool, beer and grain passing through the Longcot Wharf to Faringdon and the Cotswolds was in excess of Swindon and Wantage. With the coming of the railway, the canal trade declined but local dairy farmers were quick to recognise the growing demand for milk in London by shipping daily supplies via the newly opened Faringdon station. In the 1830s with the Canal trade at its height, Longcot had numerous pubs and shops. Nowadays all the shops have closed, but fortunately one pub, the King and Queen, remains. Today with good road and rail communications in the area Longcot is a commuter village and people work in diverse employment, many travelling long distances. There has been a church school in Longcot for nearly 300 years. The current school on the Green has been extended to give modern spacious classrooms with good teaching resources. While the accommodation has improved greatly over the years, the ethos remains that of a small village school aiming to create a caring environment in which to develop the full potential of each child. 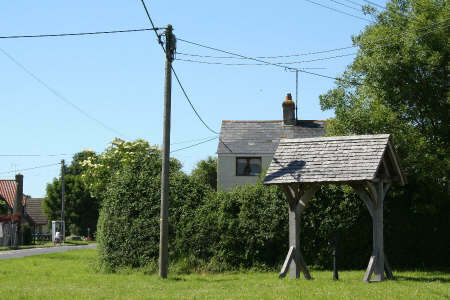 The village has a Community Room attached to the school that serves as a village hall and is available for hire. St Mary's church nave and chancel date from the 13th century, although only one original window remains. Later additions include the north porch, which is a fine example of 15th century timberwork, and the tower was rebuilt after it collapsed in 1722. When the church was restored in the 19th century the roof space was opened up and plaster removed from the internal walls. Until this renovation there were significant remnants of mediaeval paintings on the north wall of the nave, but unfortunately none of these survived the activities of the Victorian improvers. The nave contains a fine Jacobean oak pulpit with carved and panelled sides and the octagonal-based font with a plain circular bowl is probably 13th century. A brass plate on the north wall is a memorial to Lilian Carter and her husband Ernest. Lilian was John Hughes' niece and responsible for undertaking a major refurbishment of the church in memory of her uncle's long appointment as Vicar of Longcot. The inscription on the memorial records how Lilian and Ernest both perished when the Titanic sank in 1912, she giving up her place in the lifeboat to stay with her husband. Ernest Carter was vicar of St Jude's in Whitechapel and the memorial was removed from that church when it was demolished, and transferred to Longcot because of the family connection. Near to the church is a small Methodist Chapel, an attractive chequered red and blue brick building with decorated clay tiles surrounding the doorway. Joint ecumenical services are held in the chapel, which was recently refurbished, and it is also used for a variety of community activities.